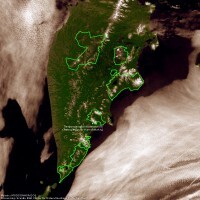 The following organizations took part in preparation of the nomination: Greenpeace Russia, NABU, "Greens of Kamchatka"
Located near the giant lithospheric crustal plates junction zone and being one of the Pacific volcanic ring links, the Kamchatka peninsula is an enormous natural "volcanology museum". Here are exhibited active and extinct volcanoes and different attendant formations: geysers, fumaroles, thermal springs, mud pots, etc. The World Heritage Property includes 6 separate clusters located in the central and south-eastern parts of the peninsula. Total area of clusters is 3.7 million ha. Altogether they reflect almost all general volcanic landscapes of Kamchatka, and at the same time each of them has its vivid individuality. In total the site includes about 30 active and 300 extinct volcanoes. One of the most interesting places in Kamchatka is the Kronotsky Biosphere Reserve with its 12 active volcanoes and the famous Valley of geysers discovered in 1941 by geologist T. Ustinova. Here geysers' funnels, some of which bear such evocative names as the Giant, the Great, Triple, the Firstling, Sugary, gush out fountains of hot water and steam with strict periodicity. In total no less then 20 large geysers and dozens of smaller ones are met along the 6-km section of the valley. Another one distinctive place of the Reserve is the ancient caldera of the Uzon volcano (discovered in 1854): vast volcanic bowl 9-12 km in diameter with rims of 200-800 m high, within which are concentrated plenty of mud pots and thermal lakes. Other clusters of the "Volcanoes of Kamchatka" site are: Bystrinsky Nature Park, Nalychevo Nature Park (includes vast Nalychevskaya health resort zone with dozens of healing springs), Yuzhno-Kamchatsky Federal Zakaznik (Kurilskoye lake), Kluchevskoy Nature Park (Kluchevskaya peak with its picturesque cone-like shape acknowledged as the Eurasian highest active volcano - 4750 m). The region is distinguished by the highest biodiversity level and features a line of rare and disappearing species. In the single Kronotsky Reserve the flora list includes 766 species of vascular plants, 6 of which are inscribed into the Red Book of Russia. Among mammals met within this cluster we should note the brown bear (the Kamchatka subspecie - one of the largest in the world fauna), wild reindeer, bighorn sheep, kalan, sea-lion and among birds - rare prey species like osprey, golden eagle, white-tailed eagle and Steller's sea eagle (Kamchatka counts some 1/2 of its world population). Local mountain rivers are distinguished by extremely high productivity, diversity and number of Salmonidae. In summer and autumn millions of salmons move forward to their spawning areas against rapid current. Large seabird colonies concentrate on rocky shores, dolphins and whales often enter the coastal waters. 03.12.08 - Working meeting "Nomination and management of the serial transnational World Heritage properties"
Booklet "Volcanoes of Kamchatka – the World Heritage Property"